By Chrissy Beckles, President and Founder of The Sato Project. All photos by Sophie Gamand. Our most recent rescue mission started back when my beloved sato Boom Boom died suddenly in May 2016. Boom Boom was the catalyst and inspiration for The Sato Project. Devastated by her unexpected loss, we searched for a way to honor her legacy. We launched the Boom Boom Beckles Fund on what would have been her eighth birthday, May 20th. Our goal was to use these funds to rescue eight dogs from the shelter in Arecibo, PR, where we found Boom Boom in 2009. Thanks to the incredible generosity of our devoted supporters, we raised just shy of $10,000. Two weeks ago, I went to the Arecibo shelter to fulfill our promise to rescue these dogs who would otherwise never have a chance at survival. I was accompanied by my good friend and Sony World Photography Award winner, Sophie Gamand (you can read Sophie's blog and see more photos from our visit to Arecibo here) and our Community Outreach Coordinator and vet tech Sharday. We did not have any idea what to expect, but we had all prepared for the worst. Following is an account of what we witnessed during our two and a half days at the shelter. I do not share this with the intent to criticize the shelter or its staff. I commend their efforts and cannot imagine doing what they do on a daily basis, year after year. As Sophie said, they are the heroes, cleaning up the mess made by irresponsible people. I share this because the dire situation at this shelter exemplifies in a visceral, terrible way, the consequences of people’s refusal to sterilize and vaccinate their animals. And this is what it looks like when people treat their pets like trash to be taken to a dump. The Arecibo shelter (known as Albergue Capitan Correa) is completely overwhelmed and understaffed. There is a never-ending stream of ‘drop offs’, and they are also the receiving shelter for dogs collected by the local municipality. They rely on their community veterinary clinic and adoption fees for their meager funding. In a ‘good’ month they adopt out around 15 dogs, but often that number is closer to 10 per month. The small, dedicated staff at this shelter is on a Sisyphean mission. They are doing their best with essentially nothing. They proudly showed us a spotless surgical suite they had outfitted with donated or reconditioned equipment. When a hydraulic base was donated, an exam and procedure table was fashioned by putting a large piece of found granite on top. A wet table had also been made out of recycled parts. The scene and circumstances in the intake building are, quite frankly, horrific. It houses the kennels for the dogs that have been newly dropped off, many of whom are immediately scheduled for euthanasia. There are rows of concrete kennels along one wall that are two stories high. The bottom kennels have no natural light and the dogs are in complete darkness. The bars on the kennels are wide, and we witnessed puppies and small dogs squeezing through. Puppies are routinely put in the top tier of kennels and we learned it is not unusual for them to fall out. There are large communal runs in the center that house groups of dogs. The fencing between them is in disrepair, and we saw dogs scrambling between runs and fighting over food and a female in heat. We saw one dog almost hang himself when he got caught in a rope that had been used to try to repair a gap in the fence. It was utterly overwhelming. The adoption center is in a separate building and houses around 30 dogs and puppies and 20 cats and kittens. There is even one pot-bellied pig that has become the shelter mascot. When we walked in to the adoption center, the first dog we saw staring and jumping up at us from her run was a freckle-faced little pup that looked strikingly like Boom Boom. Sophie looked at me and I tried to hold myself together. Here was our sign: our mission had officially been given the Boomie seal of approval. The shelter has quite a large number of volunteers mostly from the local schools (students are mandated to do some kind of community service in Puerto Rico). They are all put to work in the adoption center, bathing and walking dogs. We were surprised to learn that some dogs had been languishing in the adoption center for a very long time, waiting patiently for families. Their time was running out. Puppies are usually adopted first, so as a dog gets older, its chances of leaving alive decrease daily. 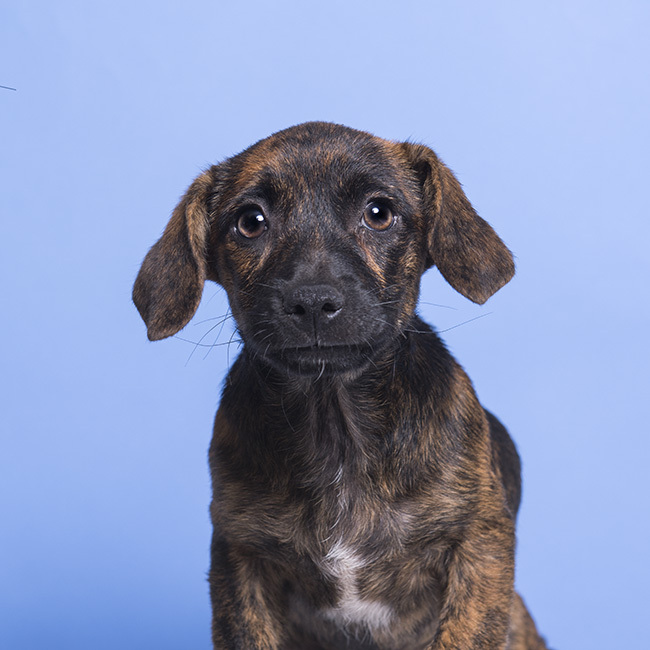 Sophie offered to do a photo shoot for all the dogs from the adoption center, and we know their fabulous new head shots will aid in their adoption process. Over the two days we were at the shelter making the agonizing decisions of which dogs to take with us, more dogs and puppies were being dropped off every hour. First came a box full of 11 two-day-old puppies. The person leaving them ‘did not want to deal with puppies.’ They were literally screaming with hunger. There was no lactating female in the shelter, and they were scheduled for euthanasia. They did not ask to be brought into this world to live a horrific 48 hours and then die. We will be forever haunted by their cries. We thought that was a one-off. But a few hours later another box of one-week-old puppies arrived. Then came a large plastic bin full of Great Dane and Labrador puppies. Then nine Rottweiler puppies . . . and so it continued. This was just one day. The shelter reports a euthanasia rate of 85%, but that doesn’t include the many which die while in limbo in the intake center. Anyone who does not believe in spay and neuter should witness what we saw and heard. I truly believe their minds (and hearts) would soon change. Choosing which dogs to take from this shelter was the hardest thing I have ever had to do, because we knew almost all of the dogs we left behind would not be making it out of there. And yet we had to choose. We first decided on three dogs from the adoption center who were running out of time. The first we named Chantal, a small black lab mix whom no one had been interested in for almost three years. Her days were numbered. Another freckled female with spectacular sato ears had already been returned to the shelter twice, because she was shy. She looks like a little fawn, so we named her Bambi. The third was a beautiful young retriever who was ‘a jumper’, which essentially rendered him unadoptable. His name is Casey. The rest of the dogs we chose from the recent intake group: A spaniel with a 'cherry eye' brought in by the municipality truck while we were there, was immediately scheduled for euthanasia. We named him Elliot. Two females who stuck to each other like glue in the middle of their large run full of dogs, we named Thelma and Louise. An older little cream terrier with one eye and three teeth, and a tail that never stopped wagging, had a collar on and was an owner surrender. I asked if he was a candidate for adoption (one-eyed dogs are always popular). ‘Unfortunately, no’ was the answer. We named him Marvel, the one-eyed wonder. Each team member got to pick a dog: Sophie fell for a listless brindle puppy who reminded her of a favorite subject she had photographed and fostered. He was given the spectacular name of McLovin. Another animated young female caught the eye of Sharday, who named her Pepper. By the end of our first day there, we had chosen nine dogs to return for the next day - one over our budget. But of course we knew that would happen. After we left, I lay awake most of the night, going over in my mind what I had seen, smelled, and touched. There was one little dog whom I could not forget. She was a tiny puppy cowering the back of the first intake cage. There were two other much larger puppies with her, and she had been trying to make herself as small as possible to avoid contact with them. She looked sick and I did not think she was going to live very long. I couldn't forget the eyes of this little puppy, making herself as small as possible in the corner. Now named Bugsy, she's safe in our care. There is a picture I have of Boom Boom just after she was taken from Arecibo in 2009. She is in the vet’s office, finally safe, but she has a look in her eyes that is saying she is giving up. There is nothing there: no light, no fight - nothing. This little puppy in the back of the cage had the exact same look. I decided if she was alive when we returned the next day, she was coming with us as our 10th rescue. The next morning, we reconvened back at the shelter with more cars and crates. Sharday arrived first and went immediately to check: my little one was still alive! I named her Bugsy which was one of the nicknames we had given Boom Boom. All that second day more and more dogs and puppies kept arriving. When Sophie finished shooting her portraits, we gathered up our dogs in their crates. I signed paperwork and we loaded the crates into the cars. I don’t think there was a single person not crying. But we had one empty crate. I looked at Ivette and Sharday and said “We are not leaving with an empty crate.” I asked Sharday to go back in for one more dog, and she ran to the intake building. A small terrier had just been dropped off who appeared to be pregnant, which meant an immediate death sentence. Sharday grabbed her, and so we had 11. This last little lady we named in honor of her rescuer. After witnessing the conditions at the Arecibo shelter and seeing the dedication of its staff, we have all been fueled by a desire to do something more. They are truly desperate for help. The fences between runs need replacing and the bars on the kennels need to be reinforced to stop puppies falling through. Their currently unused quarantine area needs to be rebuilt with tiles so it will be functional. These are immediate critical needs. Another wish is for a dental machine to allow the vet clinic that funds the shelter to do dental work on dogs and attract more clients. The cost for these items is approximately $10,000. After a couple of days of processing all of this, I suddenly realized what I wanted to do. It just so happens that The Sato Project recently received an extremely generous and unexpected gift. Tyler Ackerman is one of five siblings and their parents who run The RTA Store, a custom cabinet business in New York. He learned about The Sato Project from an Instagram post this summer. He and his family have witnessed the suffering of dogs in Puerto Rico first-hand, and they vowed to do something to help. So they offered to match all donations, dollar-for-dollar, up to $10,000 – resulting in $20,000 overall. Tyler’s family and many of The RTA Store’s customers had already contributed over $1,800 to The Sato Project towards their $10,000 goal, but in order to receive their full matching offer, they asked us to share their offer with our followers. We asked Tyler if we could use their matching funds to support these much needed improvements to the Arecibo shelter, and he was all for it. With this unexpected support from The RTA Store, The Sato Project will be able to cover the costs of fixing the kennels in the intake building, tiling the quarantine area, and to purchase dental equipment to help provide another stream of steady income for the shelter. We are thrilled to report that we reached the $10,000 funding goal within several hours of sharing this story with our followers. I realize that this is a departure from our focus on Dead Dog Beach, and we continue to keep our promise to those dogs every single day. However we cannot forget what we saw in Arecibo, and the reason that we were there at all. Every dog The Sato Project has rescued is because of Boom Boom. If you have adopted from us, then the love of your life is safe now because of her. I made a vow to Boom Boom to do everything I could to help her Puerto Rican brothers and sisters, and that promise now includes helping the shelter where she came from. Stay tuned for continued updates on the help we are able to give the Arecibo shelter, and more dogs we will rescue from that shelter in the months and years to come.